It has been a question of many Accounting persons (particularly in the U.S.) whether the IASB’s funding sources are stable enough for it to truly be the world’s top accounting standard setter. 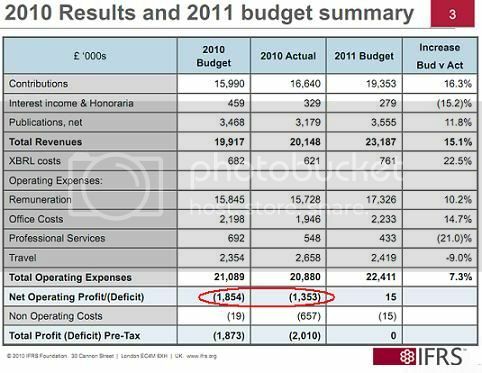 Now, here the answer came out: IFRS disclosed an operating deficit of £1.3 million ($2.1 million) for 2010. Contributions exceeded budget, largely because of favourable exchange rate movement. New country regimes were established, but were offset by a loss of some contributions. Publications income was lower than budget, due to a decline in overall book sales and more liberal policy on copyright waivers. Remuneration and other expenses, with the exception of travel, held below agreed budget. Increased travel reflects greater Trustee activity (meetings, stakeholder engagement) and intensive IASB outreach.